Trying too hard, or pretending to be someone other than yourself, can disturb your heart energy and lead to a range of health issues. Here’s a way to tame that feeling of trying, or pretending, and improve your health. 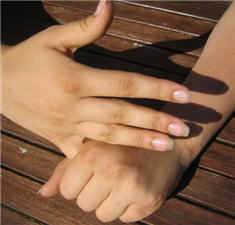 Simply use the thumb and fingers of one hand to gently hold the little finger of your other hand. This balances, clears and harmonises your heart and small intestine energies. With your heart balanced you’ll be more receptive to your intuition and wisdom. As with the other Jin Shin Jyutsu finger holds: either hand can do the holding; hold until you feel relief; and repeat as needed. You can’t overdo finger holds, and they are easy to do in many situations without anyone noticing! These types of thinking all emerge from being insecure in ourselves – from pretending to be other than who we really are. So a natural consequence of this finger hold is to boost your self-esteem. And, besides helping your heart, think how much mental energy avoiding that lot will free up! Try holding your little finger to help you become true to yourself, and experience the cascade of health benefits that brings. MAM WHAT DOES IT MEANS THAT WHILE HOLDING THE LITTLE FINGER AFTER 4 OR 5 MINS I STARTED TO SMILE NATURALLY…AND MY FINGER WAS TRYING TO BREAK UP THE HOLDING. First, my apologies for replying, Vineet. I think a natural smile means you’re feeling happy, and can only be good. Your finger breaking the hold suggests you’d held it for long enough for that session. However, more important is how you interpret those things!